In yet another adaptation of the Jules Verne classic, this time by Laura Eason, we went on a whistle-stop tour of the world as it was, or at least as it was romanticised as being, back in the days of Victoria and Empire. This version was one whose target audience though was not the hardened mature theatre-goers like myself, but the tweens and youngsters who might well be coming to the theatre for the first time, and the way in which this company engaged this audience and made them feel safe before making them complicit and a part of the story was excellent. I have been to something in excess of 100 pantomimes and even more children's shows, and rarely have I seen a cast able to 'work' the audience and slowly involve them more and more in the way this cast did, and for this evening's audience, which was made up in no small measure by majority younger generations, this was delightful and they loved it. However, back to the stage, and as we entered the auditorium we were presented with an open set. A simple set of stairs created by trunks and valises with an umbrella handrail on the top platform, whilst the backdrop was a map of the world as it was, showing the extent of The British Empire. It was simple but very evocative, even down to the sepia-coloured lighting effect, giving it an olde-worlde feel (Lis Evans). The only thing I would have liked to have happened, which sadly it didn't, was that we could have followed the protagonists' journey on this map too, using a string of lights, or some such device to plot the course physically. The directing (Theresa Heskins) was tight, imaginative and consistent, and utilised a small, multi-talented cast perfectly. The physical comedy pitched perfectly, and the comedy fight routines (Beverley Norris Edmunds) which included spot on sound effects every time, were some of the best I have ever seen. The story, just in case you have missed all of the 9 million different versions of this novel available, and not read the novel either, concerns a certain Victorian society gent, Mr Phileas Fogg, who accepts a bet from his cronies at The Reform Club that he cannot circumnavigate the globe in 80 days. The year is 1873, and the wager of £20,000 was an absolute fortune back then, and 80 days an unrealistic challenge, and so as far as everyone was concerned, their money was safe and he couldn't complete the task. However, armed with his Bradshaws (the essential book for all travellers containing train timetabling and other essential information) and his newly appointed unconventional French Valet Passepartout, he sets out and of course does make it back with only seconds to go. Andrew Pollard was Fogg in this production, and a very personable and thoroughly British Fogg he was too. He was easy to watch and despite being a caricature was also very real. Passepartout, or whatever name was given to him, was played with understated class and style by Michael Hugo. It was mostly Hugo's responsibility to engage the audience which he did with utter charm, and his physicality was superb. The police inspector who we first see waiting for Fogg in Suez, since he believes quite wrongly that Fogg has robbed the Bank Of England, and then continues to pursue him all the way back to Liverpool, was played this evening by Dennis Herdman. Owing so much of his characterisation to the late, great Lionel Jeffries in Chitty Chitty Bang Bang, but giving it his own personal twist, it was hilarious and solid. Along the way too, Fogg and Passepartout save an Indian princess from throwing herself on her husband's funeral pyre, and she travels back to England with them and of course she and Fogg fall in love. Kirsten Foster played this role of Mrs. Auoda with skill. If I have to be picky, then her accent went through several metamorphoses during the show, but I don't think the majority of the audience noticed this. Pushpinder Chani, Nyron Levy, Matthew Ganley and Joey Parsad completed the talented ensemble and these four played characters multifarious, even animals, throughout the show, and their skill as performers truly brought the story to life. I particularly liked the elephant and the Malabar Hill Temple sequence, and the circus act in act 2 was also noteworthy. With a quiet and reflective section just at the end, enough to bring a tear to the eye of even the hardest of theatre critics, and then a celebration and wedding to finish, this was a joyous and excellently developed show which hit its target audience firmly and squarely on the head with great aplomb. It is hugely entertaining and a great antidote for those who want some seasonal entertainment but can't cope with panto any more! 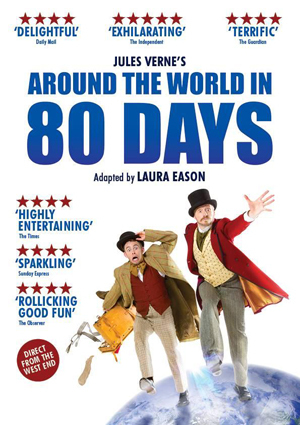 Around the world in 80 days plays at The Lowry until January 7, before completing it current tour in Norwich.